Reference number for this case: 25-sep-54-Joinville-le-Pont. Thank you for including this reference number in any correspondence with me regarding this case. "- You relate the facts of which people worthy of faith have been witnesses. A friend, Mr. D .., and I, walked on the banks of the Marne, at 9:35 p.m., September 25, in Joinville-le-Pont. A craft descended vertically and landed noiselessly twenty meters from us... Two beings came down, two strange characters of about 1 meter 10, their faces covered with hair. As I was immobilized by the ray, one of them rushed at me and pulled off my trousers; which may seem incredible to you, and yet there were two of us. My friend shouted and the two Martians climbed into their machine; which rose vertically. This story, obviously without credibility, to say the least, was found in 1979 by "skeptical" ufologists Gérard Barthel and Jacques Brucker, who did not know the precise source other than under the name of "The Little Flying Saucers Mailbag" which would be "in the file." They paraphrased it and hoped that the attackers of Mr. Perret made good use of the trousers that the Parisian industrialist wore, ironizing on the "connoisseur's penchant for the Parisian ready-to-wear" of the "space explorers." The same year 1979, Michel Figuet and Jean-Louis Ruchon then quote the story, saying that it comes from a "Small flying saucers mailbag" column of an unknown newspaper they date falsely of October 26, 1954. 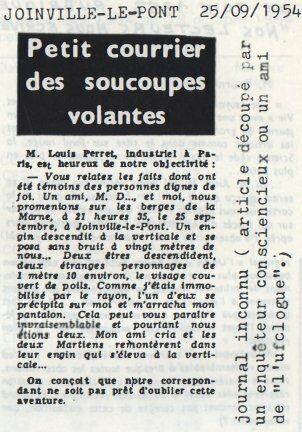 Figuet would give a copy of the article, still without precise origin, in the ufology magazine Lumières Dans LA Nuit #249-250 of March - April 1985, making of the story an example of nonsense published in the press, and noting that there was no investigation. He will subsequently class the case variously as a hoax or probable hoax in the publications of his Francat catalog. It was only in 1997, that author Jean Sider gave the story its correct source, Ici-Paris for October 11, 1954, page 12. Sider suggested a possible hoax but let "the reader judge for himself". He is surprised - wrongly - that, if it were a hoax, it already evoked hairy extraterrestrials such as those reported later (Sider does not realize that whereas the case allegedly occurred on September 25, 1954, it was only reported on October 11, 1954, when the "hairy Martians" have already appeared widely in the Press so there is nothing unusual that they appeared in such a hoax). In the decades that followed, "proponents" and "skeptics" alike reported the story based on the 1979 Figuet version. Thus, Larry Hatch, Godelieve van Overmeire, Donald Johnson, Albert Rosales, Luc Chastan, Fabrice and Daniel Kircher, Julien Gonzalez and others continue to spread without any apparent doubt the story of these pants-stealing extraterrestrial visitors; and this goes on even after I published my file on the case on the Web from 2005 on, and after "skeptical" ufologist Dominique Caudron on his side published own file on the case on the Web from 2017 on. - You tell facts of which persons worthy of faith were the witnesses. A friend, Monsieur D..., and I were walking along the banks of the Marne, at 9:35 p.m., on the 25th of September, at Joinville-le-Pont. A craft descended vertically and landed without noise twenty meters from us... Two beings came down, two strange characters of about 1 meter 10, the face covered with hair. As I was immobilized by the ray, one of them rushed on me and pulled off my pants. It may seem incredible to you, and yet there were two of us. My friend screamed and the two Martians climbed into their machine; which rose vertically. We understand that our correspondent is not ready to forget this adventure. "Mr Louis Perret and a friend walks on the banks of the Marne. It is 09:35 p.m., an apparatus comes down vertically and lands without a noise at 20 meters of them. Two beings come down, two strange people of 1,10 m approximately, the face covered of hairs." "- As I was paralyzed by a ray (no description), one of them rushed on me and tore off my trousers." "My friend shouted and the two beings went up in their machine which rose vertically." The authors comment on that they hope that the attackers of Mr Perret made good use of the trousers that the Parisian industrialist wore in his twilight walk in Joinville le Pot and that it seem that the explorers space space have an experts' taste for French fashion. The two authors indicate that at Joinville-le-Pont in the department of Val-de-Marne, on September 25, 1954 at 09:35 p.m., Louis Perret and a friend were wandering on the banks of the Marne. Suddenly an object descended vertically and landed without noise within 20 meters of them. Two small 1.10 meter beings, the face covered of hairs, went down of it. One of the witnesses was paralyzed by a ray. One of the beings threw at him and tried to tear his trousers off him. The other witness shouted and the two beings fled to go up in their machine which rose vertically and disappeared. The two authors note that the case is dubious because there was no investigation. The authors indicate that the source is a "Journal with title unknown under the heading: 'Small flying saucers mailbag' of 09/26/1954." Note: Michel Figuet showed here that the theory of so-called alignments in isosceles triangles of the cases of the wave of 1954 in France claimed by J.C. Fumoux was false, because most of the cases used by Fumoux were at wrong dates and / or not genuine. Figuet gave this case as an example of a hoax nevertheless taken into account by Fumoux. 77 CE3 25 09 1954 21.35 Joinville-le-Pont 94340 C 5 E.P Hoax? This ufologist and author indicates that there was a close encounter or the third kind in Joinville-le-Pont in the Val-de-Marne on September 25, 1954 at 09:15 p.m. He indicates that Mr. Louis Perret, a Parisian industrialist, accompanied by friend who remained anonymous, was walking on the banks of the river Marne. A craft was noticed coming down to the ground vertically, landing noiselessly at 20 meters from both men. Two beings about 1m10 came down, the face covered with hair. Mr. Perret felt paralyzed by a ray "(sic)" and one of the hairy dwarves rushed to him to tear off his pants "(!)". Then the two characters went back to their apparatus, which went up again vertically to disappear in the sky. Jean Sider indicates that the source is Ici-Paris, Paris, October 11, 1954, page 12. He comments that this is actually the letter of a reader sent to the Parisian weekly, that Figuet, page 86, refers to an unknown newspaper with a wrong date. Jean Sider wonders if this is a hoax and suggests that the reader makes his own decision. He assures: "I notice, however, that this is the first case of the flap featuring a small humanoid with a hairy face, a type of occupant who will appear later in other CE3's. Therefore, if this is a hoax, it is really an extraordinary coincidence." The Belgian ufologist indicates that in 1954, on September 25 in France in Joinville le Pont "At 21:35 Louis Perret of Paris and a friend walk along the banks of the Marne. A craft comes down vertically and lands without noise at 20 m of them. Two beings go down, 1m10 tall, the face covered of hairs. "As I was paralyzed by a ray (no description) one of them rushed at me and tore off my trousers. My friend shouted and the two beings went up in their apparatus which rose vertically and disappeared." The source is noted as "M. FIGUET/J.L. RUCHON: 'Ovni, le premier dossier complet..' - Alain Lefeuvre pub. 1979, p. 86". September 25, 09:35 P.M.: In Joinville-le-Pont (Val-de-Marne), Louis Perret and another anonymous witness have a CE III. The witness is paralyzed by a ray emitted by a saucer. (Ici Paris, October 11, 1954, p.2). Possible hoax. 1954 - A disc-shaped object descended and landed along the banks of the River Marne in Joinville-le-Pont, France at 9:20 p.m. Two humanoids about 1.10 meters tall exited the machine. Their faces were covered with hair. A beam of light paralyzed both of the witnesses, and one of the humanoids approaches the witness with the initials M.P. and tore off his trousers. The short humanoids then boarded their machine, which rose vertically and disappeared at high speed. (Source: Jean Sider, Dossier 1954 et l'Imposture Rationaliste, p. 168). Walking along the banks of the River Marne MP, and a friend see an object descend and land nearby without making any noise. Two humanoids about 1.10 m in height with their faces covered with hair exit the machine. A beam of light paralyzes both witnesses as one of the humanoids approaches MP and tear off his trousers (!). The two humanoids board their machine, which rises vertically and disappears at high speed. "September 25, 09:35 P.M.: In Joinville-le-Pont (Val-de-Marne), Louis Perret and another anonymous witness experience a CE3. The witness is paralyzed by a ray emitted by a saucer. (Ici Paris, October 11, 1954, p.2). Possible hoax." Maillot notes that the color of the ray is not indicated. Luc Chastan indicates that in the Val de Marne in "Joinville le pot" on September 25, 1954, ao 21:35 hours "Two people walk on the banks of the Marne. Suddenly an object goes down vertically and lands without noise within 20 meters of them. Two small beings of 1m10 the face covered of hairs go down from there. One of the witnesses was paralyzed by a ray. One of the beings rushes at him and tries to tear off his trousers. The other witness shouts and the two beings flee to go up in their machine which rises vertically and disappears. Doubtful case because No investigations." The website indicates that on 25 September 1954 at 21:20 in Joinville-le-Pont, France "Silent disc lands, two humanoids exit. Observer temporarily paralyzed by ray." And: "A disc-shaped object descended and landed along the banks of the River Marne in Joinville-le-Pont, France at 9:20 p.m. Two humanoids about 1.10 meters tall exited the machine. Their faces were covered with hair. A beam of light paralyzed both of the witnesses, and one of the humanoids approaches the witness with the initials M.P. and tore off his trousers. The short humanoids then boarded their machine, which rose vertically and disappeared at high speed." And: "An object was observed. Physiological effects were noted. One object was observed in a town." And: "Walking along the banks of the River Marne MP, and a friend see an object descend and land nearby without making any noise. Two humanoids about 1.10 m in height with their faces covered with hair exit the machine. A beam of light paralyzes both witnesses as one of the humanoids approaches MP and tears off his trousers (!). The two humanoids board their machine, which rises vertically and disappears at high speed." The sources are indicated as Hatch, Larry, *U* computer database, Author, Redwood City, 2002; and Rosales, Albert, Humanoid Sighting Reports Database. 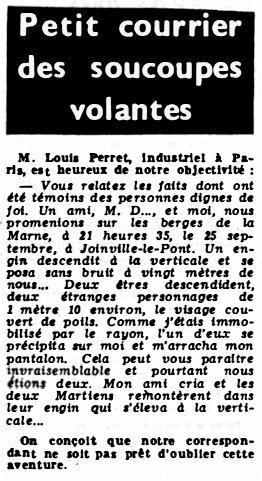 The authors indicate as example of "activities of the ufonauts" that on September 25, 1954, Mr Ferret, a Parisian industrialist, was victim of a lurid mishap when he was walking with a friend on the banks of the Marne in Joinville le Pont towards 21:15. He noticed an apparatus which landed without noise within 20 meters approximately, two 1.10 meter tall beings came out of there, Mr. Perret was paralyzed by a ray. One of the beings approached, the face covered of hair, he stripped off the pants of his victim, reinstated the craft which took off again vertically and disappeared. Sat 25 09:35 p.m. In Joinville-le-Pont (Val-de-Marne), Louis Perret and another anonymous witness make a CE3. The witness is paralyzed by a ray emitted by a saucer (48) 5. Mr. Louis. Perret, a Parisian industrialist, accompanied by a friend (anonymous), was walking on the banks of the Marne. A craft was noticed coming down to the ground vertically; which landed noiselessly 20 meters from the two men. Two beings, about 1.10 m, came down, their faces covered with hair. Mr. Perret felt paralyzed by a ray and one of the hairy dwarves rushed to him to tear off his pants. Then the two characters went back to their machine: which went up again vertically to disappear in the sky. Julien Gonzalez indicates that the sources are "Ici-Paris of October 11, 1954, Jean Sider, Le Dossier 1954 et l'Imposture Rationalist, page 169." *Sep. 25, 1954 - A disc-shaped object descended and landed along the banks of the River Marne in Joinville-le-Pont, France at 9:20 p.m. Two humanoids about 1.10 meters tall exited the machine. Their faces were covered with hair. A beam of light paralyzed both of the witnesses, and one of the humanoids approaches the witness with the initials M.P. and tore off his trousers. The short humanoids then boarded their machine, which rose vertically and disappeared at high speed. (Source: Jean Sider, Dossier 1954 et l'Imposture Rationaliste, p. 168). Walking along the banks of the River Marne MP, and a friend see an object descend and land nearby without making any noise. Two humanoids about 1.10 m in height with their faces covered with hair exit the machine. A beam of light paralyzes both witnesses as one of the humanoids approaches MP and tears off his trousers (!). The two humanoids board their machine, which rises vertically and disappears at high speed. No Martian Joinville le Pont. For the case of Joinville the bridge, the story is also implausible that the source is not very credible. Judge for yourself: Mr. Louis Perret and a friend are walking on the banks of the Marne. It is 9:35 p.m., a craft descends vertically and lands without a sound at 20 m from them. Two beings come down, two strange people of about 1.10 m, their faces covered with hair. "As I was paralyzed by a ray, one of them rushed at me and pulled off my pants." Yeah right! Ici Paris is a source of an extraordinary scientific level! To believe such a fable, is like believing in Santa Claus. Note: a clickable button in this web source leads to a detailed article about the case by this ufologist, see further down in [dc3]. The case of Joinville the bridge, would have taken place, if it had really taken place, on September 25, 1954. This would be the first story of flying saucer passengers with face covered with hair that would have been told in the national press. We searched for a long time the source of this case, which was known only as "Small flying saucers mailbag", which denoted at least an anecdotal tone. Finally, we found this damn source. It's such a credible magazine that we understand that ufologists did not think of looking in it. This case actually comes from a letter addressed to Ici-Paris. And the story is also implausible that the source is not quite credible. We understand that our correspondent is not close to forget this adventure. just this simple title, "small mailbag", already indicates that the editor does not take this matter very seriously. Unfortunately, the testimony of Mr. D.... the other witness is not mentioned. Unfortunately, while true witnesses describe the craft as they can, there is no description here. Unfortunately, this story of paralyzing ray seems straight out of a journalistic article describing the case of Quarouble. Unfortunately, hoaxes aside, close encounters with flying saucer pilots never take place in urban areas. Unfortunately, no other newspaper article corroborates this extravagant story, unlike the less extravagant cases of Quarouble, Mouriéras or Loctydy [sic]. And curiously, the time is indicated to the minute! Conclusion: This story has exactly the profile of a hoax, and not of a true observation. This case is unknown to Aimé Michel, Charles Garreau, Michel Carrouges, Jacques Vallée, and appears in the UFO literature in 1979, with doubts. Note: the date is false, it is actually 10/11/1954. 1979 Barthel and Brucker deny the authority of the source. Let's do our mea culpa here. Among all the stories we got, we had promised to submit everything to investigation; yet the narrative of the incident that follows, we have not verified, on the one hand, because the witness Louis Perret lives in Paris, without further details, on the other hand, because this case was revealed by a newspaper of "universal notoriety" and known by everyone: The small mailbag of the flying saucers of September 26, 54 (sic) 14. "Mr. Louis Perret and a friend are walking on the banks of the Marne. It is 09:35 p.m., a machine descends vertically and lands silently 20 m from them. Two beings come down, two strange people of about 1,10 meters, the face covered with hair. - As I was paralyzed by a ray (no description), one of them rushed on me and pulled off my pants. My friend screamed and the two beings went back in their craft which rose vertically. We hope that the two aggressors of Mr. Perret made good use of it, and were inspired by the cut, probably perfect, of the trousers that this Parisian manufacturer was wearing for this twilight walk in Joinville-le-Pont. The people who were investigating and looking at this time, and whom Mr. J.F. GILLE pompously names "ufologists", did not swarm all over French territory. They did most of the time an investigation like a journalist in need of sensation or in search of a stop-gap in the heading of the crushed cats would have done and in the inexhaustible "SMALL COURIER OF THE FLYING SAUCERS"
1997 Jean Sider invokes the recurrence of the hairy face. - September 25, 9:15 pm, Joinville-le-Pont, Val-de-Marne. Mr. Perret, Parisian industrialist, with a friend (anonymous), walks on the banks of the Marne. A craft is noticed coming towards the ground vertically; which landed without noise at 20m of the two men. Two beings about 1m10 come down, face covered with hair. Mr. Perret feels paralyzed by a ray (sic) and one of the hairy dwarves rushes on him to pull his pants (!). Then the two characters return to their machine that takes the air vertically to disappear in the sky. Source: Ici-Paris, Paris, October 11, 1954, p. 12. Note: This is actually the letter of a reader sent to the Parisian weekly. Figuet, p. 86, refers to an unknown newspaper with a false date!! Is this a hoax? The reader will make his choice. I note however that this is the first case of the wave featuring a small humanoid with a hairy face, type of occupant who will appear later in other CE3's. Therefore, if this is a hoax, it is really an extraordinary coincidence. Note: No need to invoke a coincidence. If the alleged witness claims that his observation took place on September 25th, there is nothing to indicate that he wrote his letter on the 26th. If that had been the case, it would probably have been published in the October 4th issue. On the other hand, if it had written it on the 7th of October, it would have been received on the 8th, and published on the 11th. On the 7th of October, the whole of France learned that in Finistere, one had observed the 5th, a Martian with a face covered of hair. There is therefore no need to evoke a prescience of the alleged witness. Joinville-le-Pont, Val-de-Marne, September 25, 1954, 09:15 p.m..
Mr. Perret, a Parisian industrialist, in the company of a friend (anonymous), walks on the banks of the Marne. A craft is noticed coming towards the ground vertically; which lands without noise at 20 meters of the two men. Two beings about 1.10 m come down, their faces covered with hair. Mr. Perret feels paralyzed by a ray and one of the hairy dwarves rushes on him to tear his pants. Then the two characters return to their craft that takes the air vertically to disappear in the sky. Sources: Ici-Paris for October 11, 1954; Jean Sider, Le dossier 1954 et l’imposture rationaliste, page 169. Note: While Julien Gonzalez reserved a chapter for demystified cases, he does not express any reservations on this case, and ignores those of Jean Sider. This case, mentioned in 1979, did not see its complete text published until 1985, and its original source mentioned only in 1997, 43 years later. Yet, as we have shown above, this case has quite the structure of a hoax, especially as it was published in a "popular" weekly, and that the alleged witness there added an implausible detail: How could the "Martian" have snatched his trousers from him, if he was still with his feet on the ground? It should also be noted that the witness does not say that he was paralyzed by a ray, but paralyzed by "the" ray. As if the action of a paralyzing ray had become ritual in flying saucer landings. It therefore seems that after reading that the witness of Quarouble had been paralyzed by a ray, and that of Loctudy had seen a Martian with a face covered with hair, Mr. Perret amused himself in inventing a refutable story, intended for a credulous readership. After all, what is most likely? That extraterrestrials make billions of kilometers to come tear off the trousers of a Parisian walker on the banks of the Marne, or that in the full wave of saucers stories, a joker writes a funny story? Note 1: This case does not seem to be mentioned, or is not mentioned anymore, or I did not located it, in the web page http://www.astrosurf.com/lombry/ovni-rencontre-2type3.htm indicated by Eric Maillot in [em1]. Note 2: Barthel and Brucker ([bb1]) published in 1979 before Figuet and Ruchon ([fr1]) that same year since Figuet and Ruchon sometimes quote the Barthel and Brucker book in their own book. Note 3: Ici-Paris, created in 1945, is the oldest French weekly "people" magazine. The headquarters were in Levallois-Perret, recalling as by chance the name of the so-called witness "Louis Perret". Is this a clue of a journalistic invention? Of course this is just a hoax. [ip1] Article in the weekly magazine Ici-Paris, Paris, France, page 12, October 11, 1954. [bb1] "La Grande Peur Martienne", book by Gérard Barthel and Jacques Brucker, Les Nouvelles Editions Rationalistes publishers, France, pp 83-84, 1979. [fr1] "OVNI, Premier Dossier Complet des Rencontres Rapprochées en France", book by Michel Figuet and Jean Louis Ruchon, Alain Lefeuvre publisher, France, page 86, 1979. [mf3] "Heureux ceux qui croient sans savoir - (Retour sur l'isocélie ou nouvelle confirmation de sa non validité)", article by Michel Figuet, in the ufology magazine Lumières Dans La Nuit (LDLN), France, #249-250, page 23, March / April 1985. [mf2] "Catalogue Francat des rencontres rapprochées en France (Listing 800 1982) (2 - Suite)", list compiled by Michel Figuet, in the ufology magazine Lumières Dans La Nuit (LDLN), France, #257-258, page 16, November - December 1985. [mf1] In the "solved cases" in "Catalogue Francat Des Rencontres Rapprochées en France - Listing 800 - 1982 - 6 - Suite et Fin", list by Michel Figuet, in the ufology magazine Lumières Dans La Nuit (LDLN), France, #265-266, page 20, July - August 1986. [js1] "Le Dossier 1954 et l'Imposture Rationaliste", book by Jean Sider, Ramuel publisher, France, page 169, 1997. [dj1] "Encounters with Aliens on This Day", compiled by Donald A. Johnson, Ph.D., compiled from the UFOCAT 2003 computer database, www.ufocat.com. [ki1] "Ce Qu'ils Ont Vu à l'Intérieur des Soucoupes Volantes", book by Daniel and Fabrice Kircher, Le Temps Présent publisher, France, pp 99-100, 2008. [gz1] "RR3 - Le Dossier des Rencontres du Troisième Type en France, book by Julien Gonzalez, Le Temps Présent publishers, France, page 91, 2014. 1.0 Patrick Gross January 29, 2010 Conversion from HTML to XHTML Strict. First formal version. Additions [go1], [lc1], [ud1], [ki1]. 1.1 Patrick Gross November 15, 2014 Additions [ni1], [ta1]. 1.2 Patrick Gross January 23, 2019 Additions [ip1], [mf3], [mf2], [lh1], [js1], [my1], [gz1], [dc1], [dc2], [dc3], Summary. Explanations changed, were "Not looked for yet. Probable hoax." and Note 1.